Tonight Santa is here! 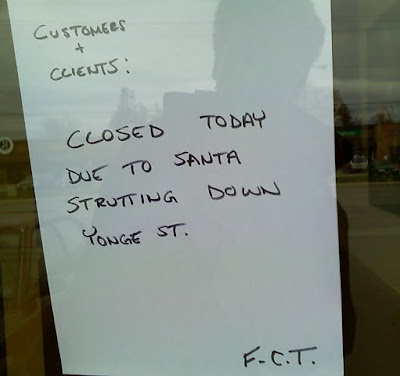 Santa is going to parade down Yonge Street in Aurora! But the worst part is for the first time that I've been Aurora, my family will not be here to wave to the big jolly red fat man who hates cookies (no I'm not kidding, click the link for Santa at the Toronto parade). Ever year since I was a kid, short of my studying in Ottawa and teaching in New York City, my parents and siblings could be found on Yonge Street eagerly awaiting the wail of the Aurora's shiny red fire engines and York Region's police cars at the front of the parade. But this year, my sister has a birthday party, my brother is in Toronto and my parents are unavailable. So it is just me and my wife at home alone watching the parade. Not that I don't like watching the parade with my wife, it just seems different that this year there will be no usual "Suddard tomfoolery" as we wait for the parade to start. This is all sad but true......sad but very true.